Toy Story 3 director Lee Unkrich often gets funny stares when he mentions that his favorite movie is The Shining. Interestingly, he notes that many of the people who knew him as a horror fiend in his youth were similarly surprised when he wound up making family films at Pixar. But that hasn’t stopped Unkrich (who was also co-director on Toy Story 2, Monsters, Inc., and Finding Nemo) from staking a claim as one of the 1980 Stanley Kubrick film’s biggest fans. He runs the Overlook Hotel, a website devoted to ephemera from the film, and he was also instrumental in helping provide finishing funds for director Rodney Ascher’s amazing documentary Room 237, about a few Shining superfans’ more notable and out-there theories. 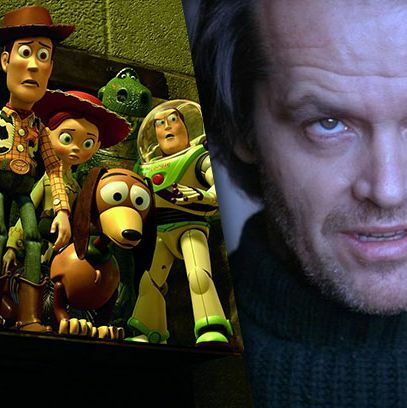 He loves The Shining so much that he recently spoke to us about the film, about Room 237, and the weird similarities between some of the theories about the Kubrick film and about Toy Story 3. When did you first see The Shining, and when did your obsession begin? I saw it when I was 12, in 1980, for no particular reason other than that it was a new film in theaters. My mom took me to see it. She’d taken me to see a few bad horror films that had affected me really deeply in terms of having chronic nightmares. But still, that didn’t stop her from taking me to see this one. And it turned out to be the best move she ever made — because it began this 32-year love affair with the film. It was the film that inspired me to become a filmmaker myself. When I was at USC film school, there was a screening of The Shining. It was the first time I’d seen it in a theater since that first time when I was 12; all the other times had been on video. I was kind of shocked and dismayed that people were laughing at it so much. I’ve come to see why people find camp value in it. But the things that people laugh at in that film I find deeply unsettling and disturbing. Why do you think it made such an impression on you? I think a lot about that, and about why it’s stuck with me for so long. The compositions, the music, the writing — it all creates a mood that’s just so incredibly unsettling. Everybody that tries to do the same is just emulating what Kubrick tried to do in that film. But I think it also has to do with the fact that I’m an only child, and I spent a lot of time alone, in my house. So when I saw the film, I related to much of it. Kids seem to have a particular relationship to this film. I saw it when I was 9 or 10, too, on TV. And a lot of other people I know who are unnaturally obsessed with it also saw it at a very young age. Yeah. It’s a film that has these very primal, pit-of-your-stomach fears in it. I have a lot of memories of being a kid and being in empty spaces in my house, thinking maybe someone was in the house. The film still brings those fears out of me. There is also something very elemental about childhood in that film, isn’t there? The fear of a parent turning on you. The idea that your family can suddenly become poisonous. And I think Kubrick and Stephen King were both coming at that idea. They just went about it in different ways, and therein lies the rift behind them. King, when he wrote the book, was going through his own bouts of alcoholism and was feeling out of control as a parent. When he talks about the book and the hotel and the spirits in the hotel, he always talks about it as something external, about these spirits affecting the family. He never talks about it as a poison within the people, within the family. And obviously that’s something Kubrick latched on to. In Room 237 there are all these theories, including one that The Shining is about the Holocaust. And when your film, Toy Story 3, came out, I remember so many people formulating their own theories about the meaning of the film — including one that it’s about the Holocaust. I remember a lot of debates among critics about that. Well first off, Toy Story 3 has absolutely nothing to do with the Holocaust. I was kind of blindsided by the whole thing. I was at an early screening, and the head of this critics’ group came up to me before we went in to do this Q&A session, and brought up this theory to me. He was convinced that he’d decoded the film. I didn’t quite know what to say. And it came up again and again in other interviews! It made me understand that a lot of times ideas make their way into films without the filmmakers being aware that they’re there. The Holocaust was never anything that was discussed in the making of [Toy Story 3]; in my case, I have my own very personal reasons for some of the choices made in, say, the incinerator scene at the end of the movie, where the toys are all holding hands. At the same time, I can sort of understand how that imagery could have evoked those feelings and thoughts in other people. I think that was the reason Stanley didn’t want to talk about his films. I know he obsessively clipped reviews and articles about his films, so I think he enjoyed reading about them, but I don’t think he enjoyed talking about them. He thought it was better to let the film speak for itself. And in my case, if thinking about Toy Story 3 in that way elevates the film for people, that’s great. I’ve heard that theory and many others. That’s what so great about Room 237. It doesn’t speculate about whether these Shining fans are right or wrong in their theories. It doesn’t pass judgment on any of them. It’s a story about obsession. I love that people are still obsessively trying to understand and decode The Shining. People want to find meaning in things that seemingly don’t have meaning on the surface. Kubrick was studying and researching so many things when he was making that film. Many of them didn’t become fully realized, but traces were left behind. Diane Johnson, who wrote the screenplay with him, said they talked a lot about the American Indian genocide. And in her mind, it was something Stanley was interested in that didn’t make itself in any formal way into the work. But if you’re designing sets, especially from scratch, there are a lot of decisions that need to be made. And in his case, that’s probably part of what led to so many of the American Indian motifs throughout the sets. And he is doing a lot of fun number play in that film: There are scripts in the Archive where you can see him working out street addresses or other numbers, variations on the number 237 or 42 and on and on. That stuff was really happening. But did he have a grand master plan of what this film really meant? I don’t know that he did. I talked to Jan Harlan, his brother-in-law and his producer, about it. He described the film as being an “impossible story.” He said that Stanley would talk about the fact that because he was making a film about ghosts, he felt it was a film that wasn’t meant to be understood. And you can see that impossibility in the design of the film and the sets. Let’s talk about your Shining site, the Overlook Hotel. What’s the craziest, or most notable, piece of memorabilia you’ve come across? Well, I started the site purely for selfish reasons. I’ve been collecting stuff from The Shining over the years, and I just wanted to have one place where they could be organized. I figured if there was at least one other person interested in the film out there, they’d get some enjoyment out of that. But then I realized that I had created a kind of Trojan horse: People started to come out of the woodwork, and they had things I’d never seen before. We’re now in the early stages of doing a book about the making of the film. I’ve had people send me things they’ve had up in their attic, and I’ve had moments where my breath has literally been taken away by the thing I’m looking at. Behind-the-scenes photos of the set from angles I’ve never seen before. Or images of the Overlook Hotel façade on the backlot where you’re clearly not in a remote part of Colorado, but in the middle of dirty, industrial London. But the biggest revelations I’ve had don’t have to do with my website itself, but with the time I’ve spent in the Stanley Kubrick Archive in London. It’s really remarkable. There’s so much speculation about his work, and he obviously didn’t speak about it much. But when you go through the Archive and see these early drafts of the film, you see another filmmaker — albeit a brilliant one — struggling with a lot of the same issues we struggle with as we’re making our films at Pixar. Trying new things. Going down blind alleys. Testing out ideas that are not bad ideas but that aren’t the best ideas. I think that was the quest he was on: He knew there was always something better out there. So, are there any films out there nowadays that you think aren’t quite getting their due, like The Shining, that will withstand the test of time and be better understood years from now? You can probably say that about any Terrence Malick film. He’s suffered the same fate as Kubrick, film after film: People have high expectations and then they’re invariably disappointed. Then the films stick around and begin to emerge as much more important than people realized when they first came out. I don’t know that there are any others. Malick seems to be the closest in my mind.